This Clovis point was found several years ago by John Dyck on the Hoyt site in the Great Basin region of Central Oregon. The Hoyt site was a habitation and stone tool manufacturing site. Several Clovis artifacts and waste flakes were surface collected on this site over a period of several years. This Clovis point is an excellent example of a heavily resharpened point. It was probably twice its present length when it was new. 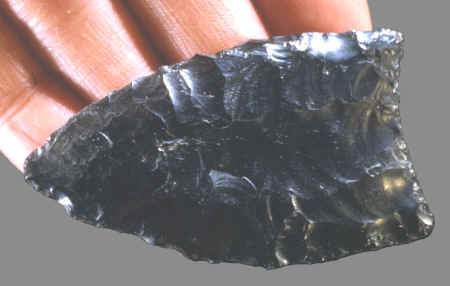 Heavily resharpened unbroken Clovis points are often found on habitation sites along with the more commonly found broken bases. These "used up" points were likely discarded for a new point that was hafted in its place. This Clovis point is made of black opaque Obsidian and measures 2 11/16 inches (6.8 cm) long and 1 9/16 (4 cm) wide.